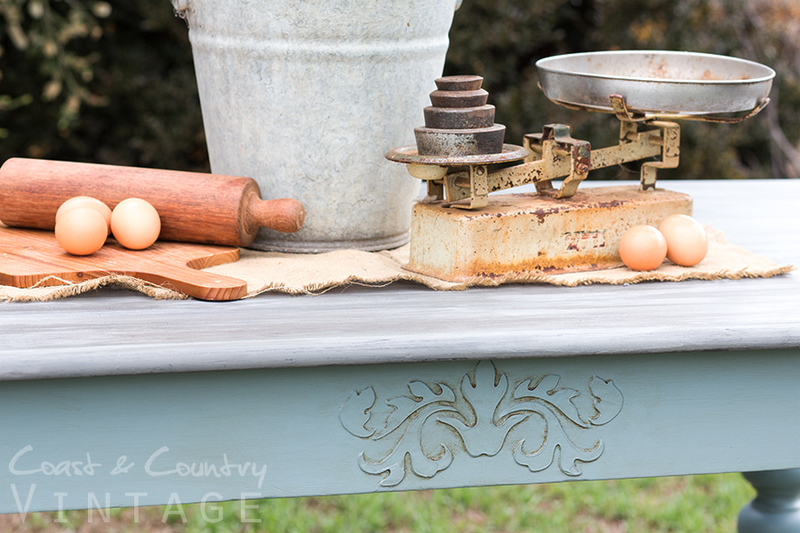 I remember quite clearly the first time I saw an upcycled piece of furniture that had raised stencil detail on the drawers and the immediate determination to learn this skill as soon as it was earthly possible. I scoured the internet for availability of the medium mentioned in the blog post (wood icing) and came up empty. At the time it wasn’t an unusual thing to find that the products readily available in the USA weren’t even on the radar here in Australia. 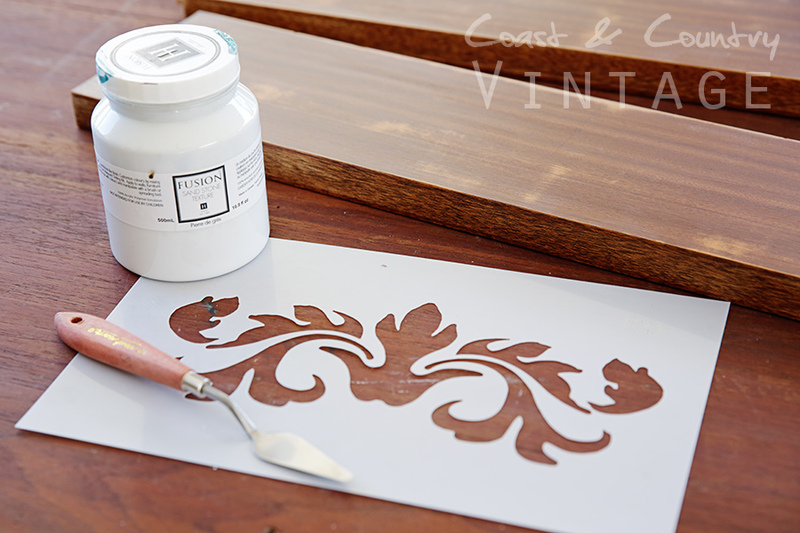 Time to practice patience…..
A very short time later, I became a Fusion Mineral Paint retailer and was thrilled to bits to find that not one but TWO products in the Fusion line up could be used to create a raised stencil! Enter Fusion Sandstone Texture & Fusion Smooth Embossing Paste! Woot! Both products do the job very well, they just have a different finish. 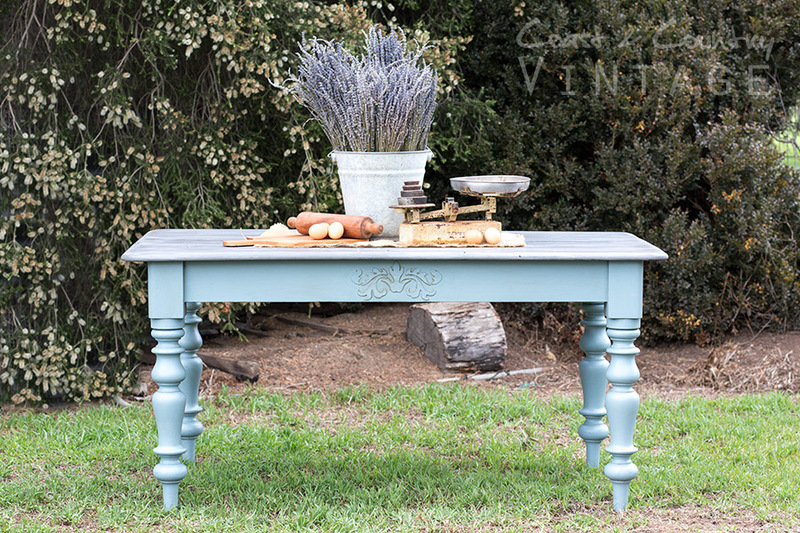 The Sandstone Texture has a slightly gritty texture and dries a little more rough to the touch. 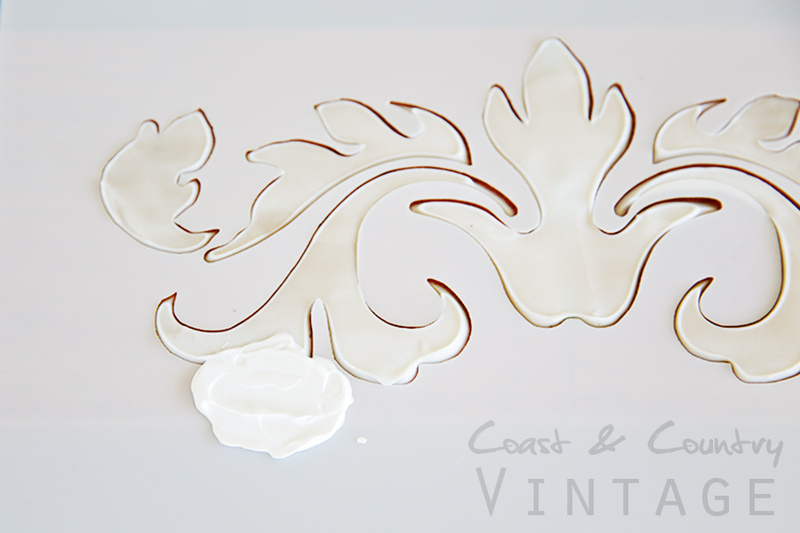 The Smooth Embossing Paste has a pearl sheen and is super smooth. 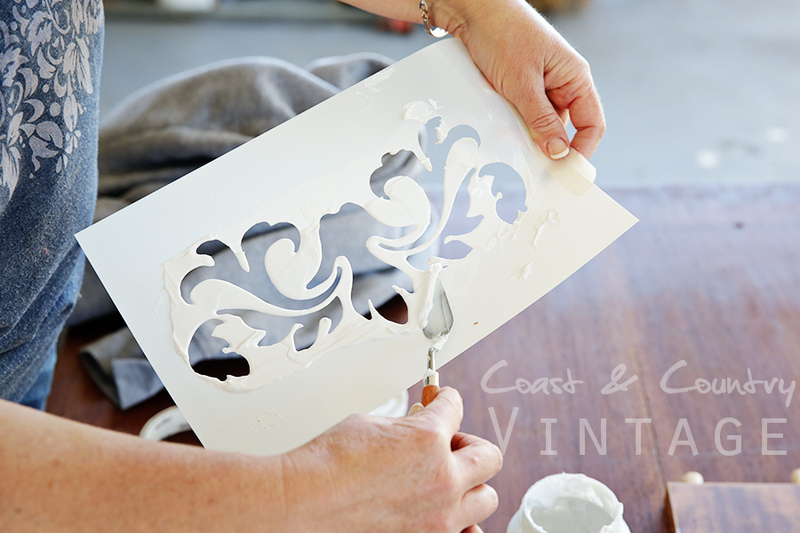 You can add any water based paint or metallic to either product to make a coloured stencil. How cool is that! More on that later! 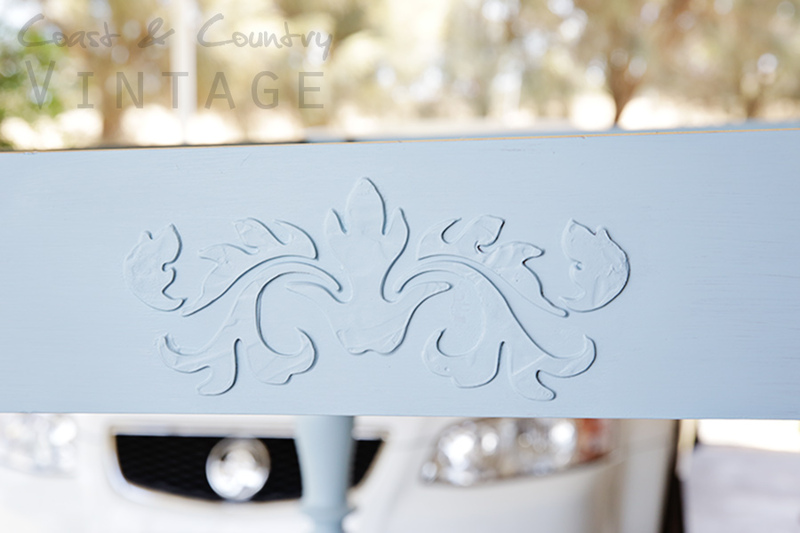 Knowing the ‘in’s & outs’ of creating a raised stencil opens up a whole new level of artistic possibilities for furniture painting, mixed media productions and home decor artworks. So lets get to the ‘HOW’! 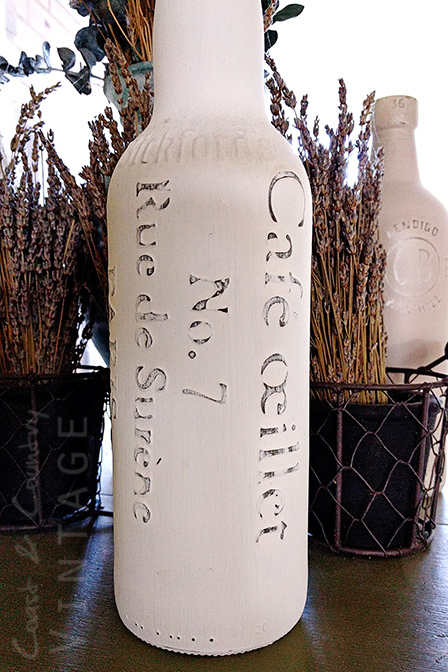 I used the Sandstone texture for this piece and apart from the texturing medium itself, all you need is a stencil, some tape and something to spread the medium with. I like to use a small artists trowel. 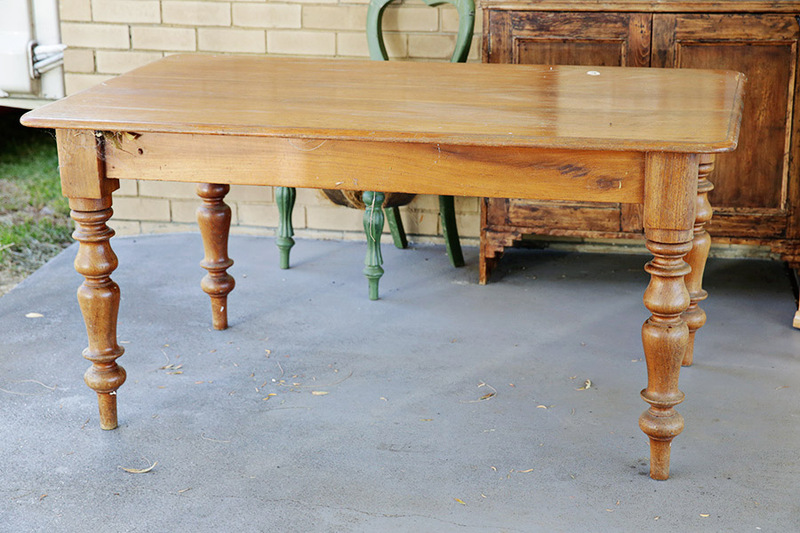 I had this old baltic pine table that had very deep ‘skirts’ so decided to add the raised stencil to each side to add interest. 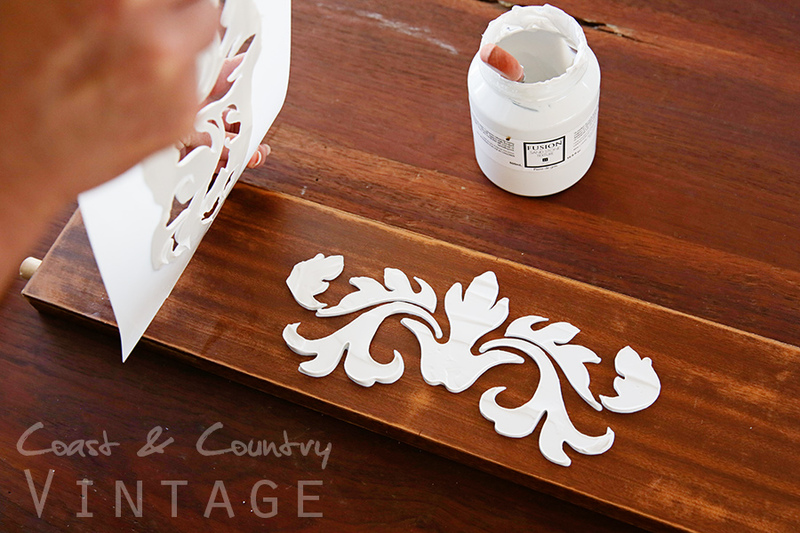 I chose the pretty Decorative Damask stencil which can be found on my website here. 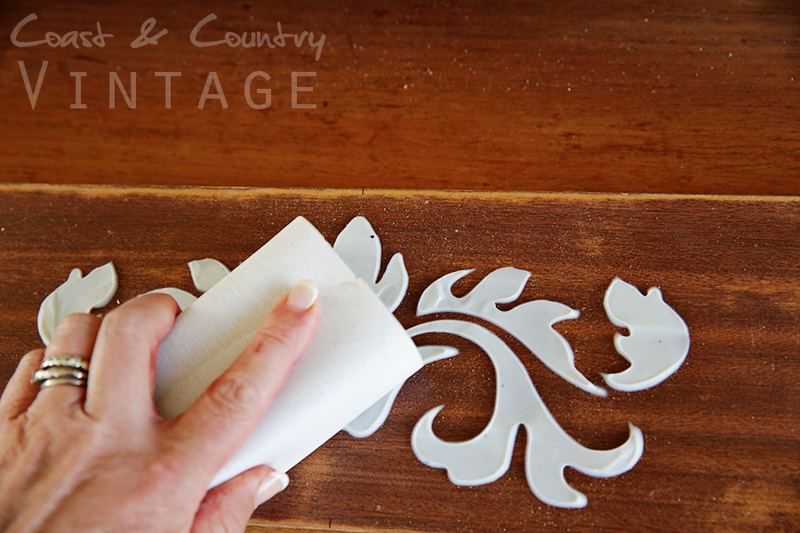 Give your surface a quick sand to remove and flaking varnish and wipe it clean. 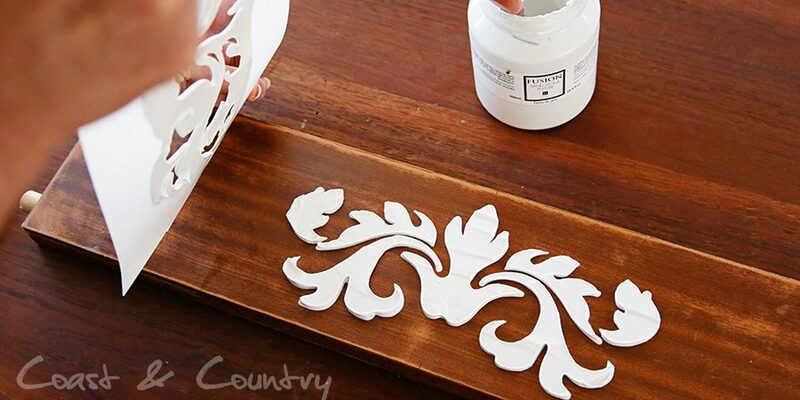 Lay your stencil down and secure it in place with some tape. Now for the fun part! Decant some Sandstone Texture onto the stencil and then begin to spread it over the stencil like you would if you were spreading jam on your toast. Be sure to hold the stencil down firmly in the area you are spreading to prevent it from lifting. 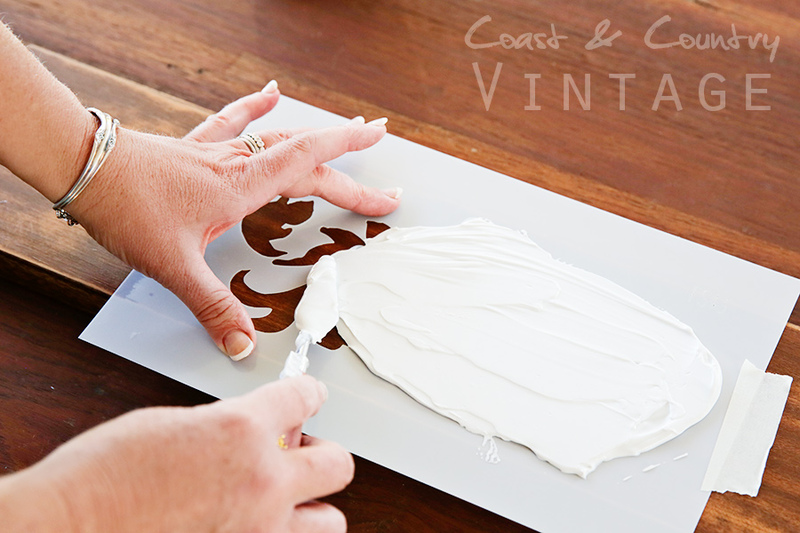 Don’t apply any pressure…just spread gently so you don’t force the medium under the stencil edges. The thickness you spread the paste will create varied results. 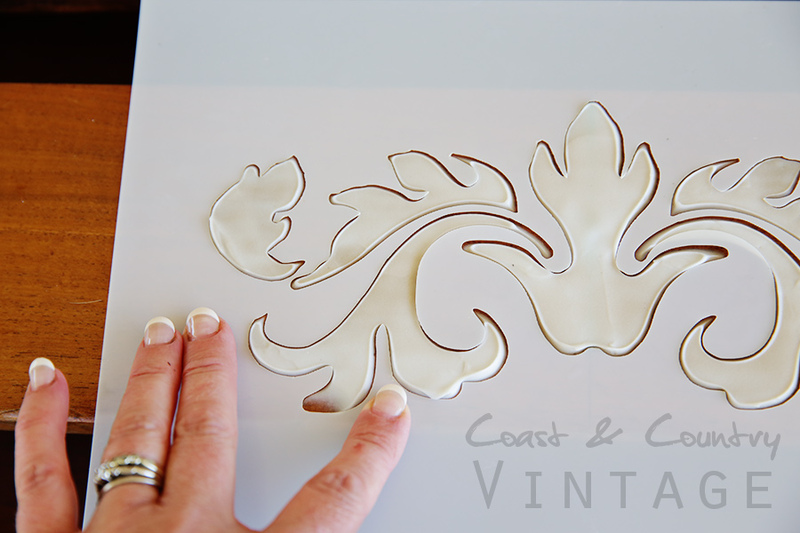 Spreading it quite thickly as I have done here will produce a chunky raised stencil similar in height to an applique. Spreading it thinly can result in texture detail similar to textured wallpaper. So many possibilities! It’s important to remember that the thicker you make your stencil, the longer it will take to dry. Mine was about 4-5mm deep and took about 3 days to dry to the full depth. I could have sped up the drying time with a hair dryer (a heat gun is too hot) but was happy to wait. 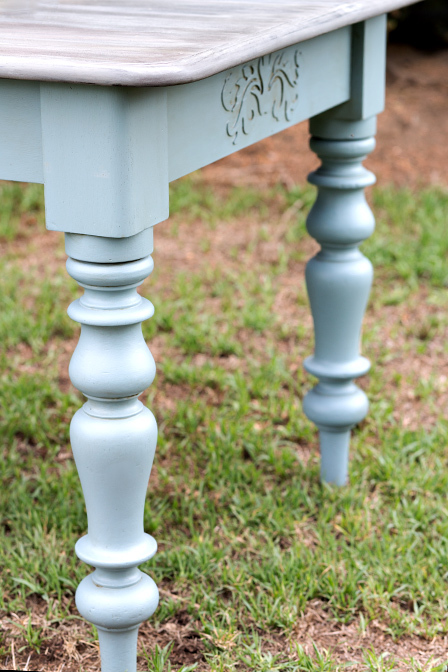 Like most other furniture painters I know, I had five other projects on the go so certainly wasn’t standing idle waiting for my stencil to dry ;). A 2mm deep stencil will only take a couple of hours to dry. 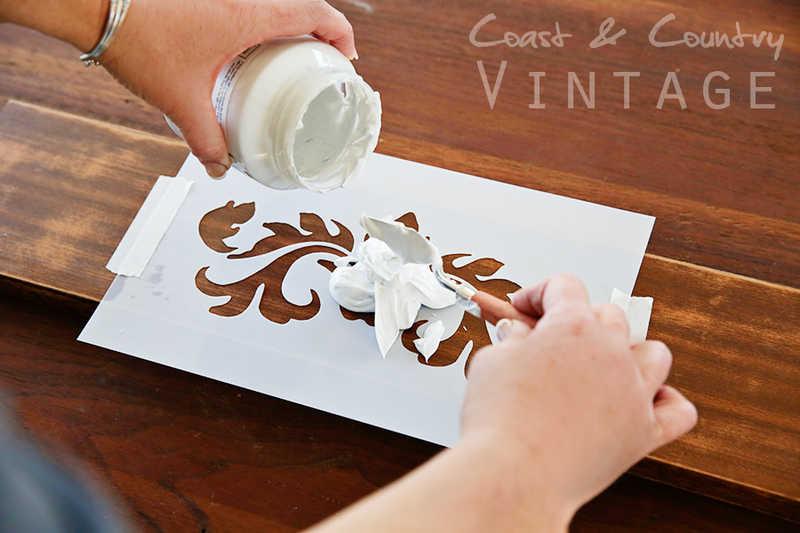 Once you’ve covered the stencil with the medium, just smooth it over a little but leave a little texture as this adds interest. 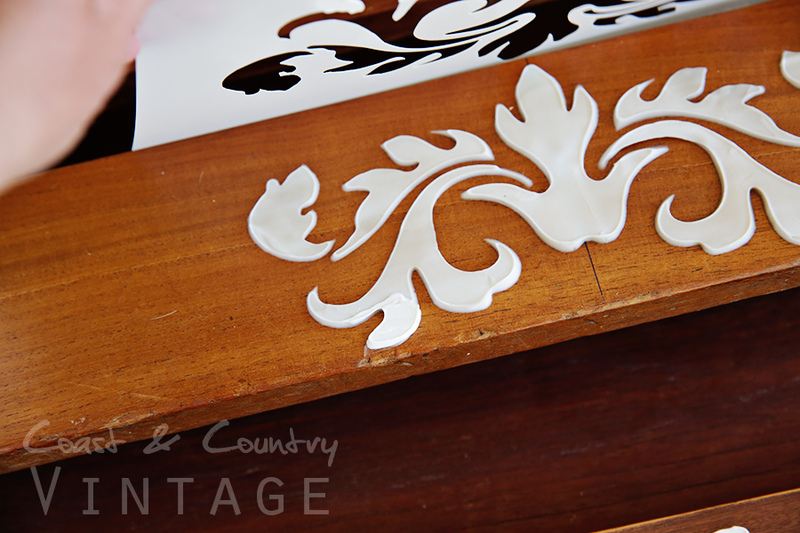 Holding the stencil down at one end, lift the tape on the other end and gently lift the stencil up. Don’t let go of the other side until the stencil is free of the medium. You can see now that my stencil is quite ‘lofty’ which is what I wanted for this piece. Scrape as much of the medium as you can from the stencil and back into the jar for next time then rinse your stencil to remove the left over medium before patting dry with paper towel. 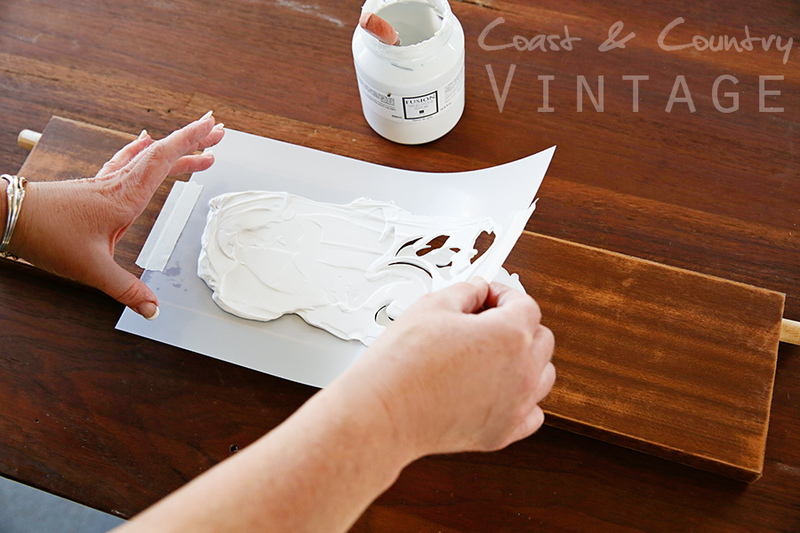 As it dries, your stencil will shrink a little and change in colour. Once completely dry it will be rock hard. If you can still leave an indentation in the medium with your fingernail it’s not completely dry yet. 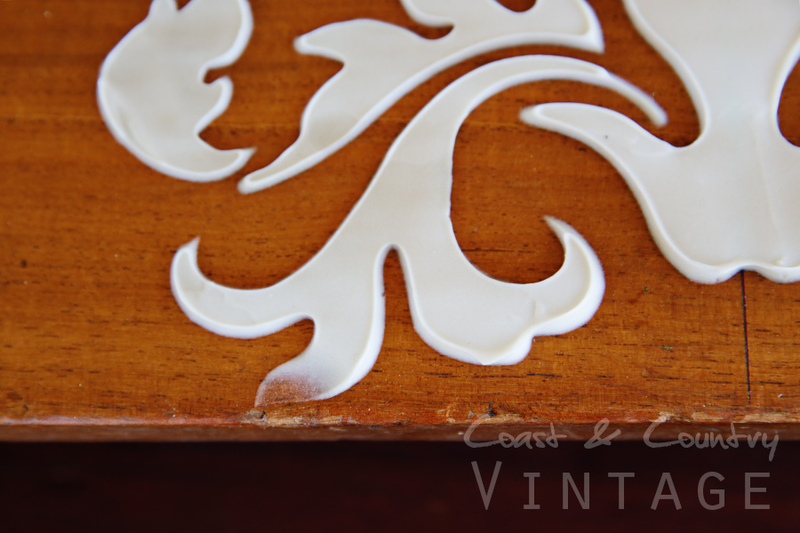 Once completely dry, sand the peaks around the stencil edges until smooth. Sometimes when you lift off your stencil, you’ll find that there’s an area where your medium wasn’t quite as thick as the rest of the stencil and once dry it can be quite obvious. This happened on the last of the four stencils I made. See the bottom left corner? As soon as I lifted the stencil I could see my mistake. But the good news is that it’s easily fixed! 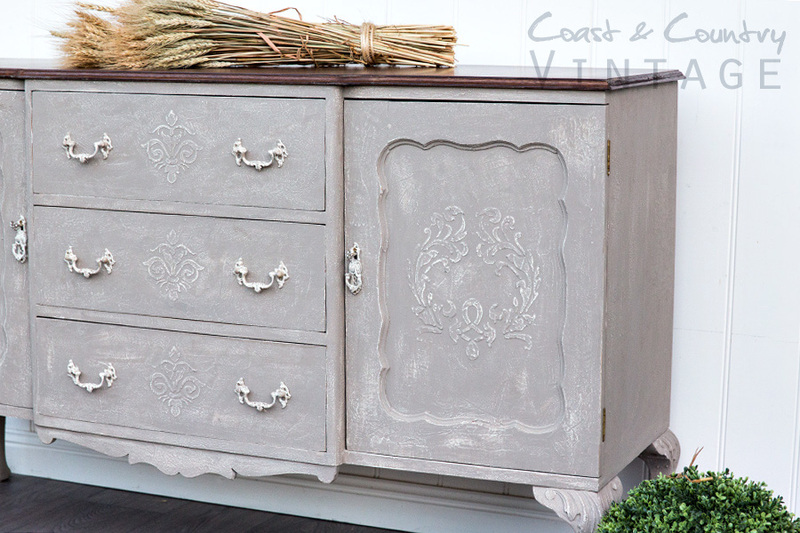 Coast & Country Vintage Paint Chat! I have a ? If you let the material dry before you remove the stencil, how can you put the excess material back in the container with unused product? 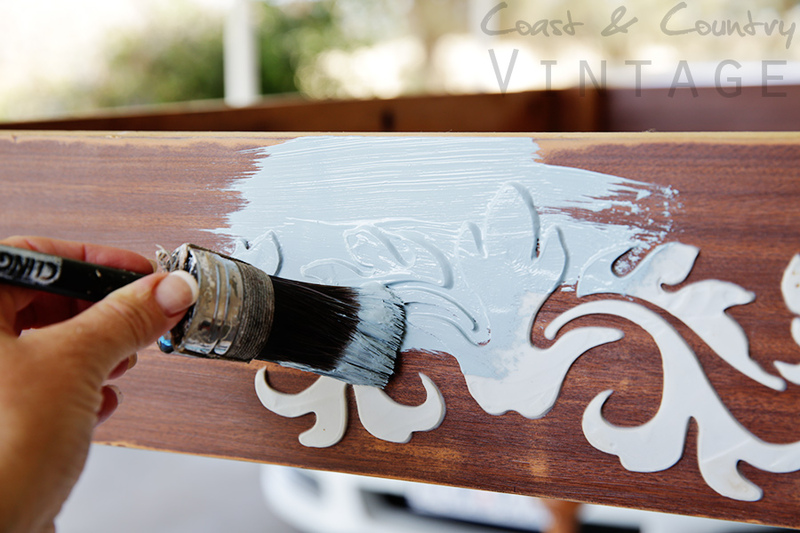 Are you actually removing the stencil while still wet and letting the pattern portion dry before you sand, paint, etc? Thanks. Sonja you remove the stencil as soon as you have finished spreading the medium over it….then scrape the excess off the stencil and back into the container. Then the raised stencil needs to dry which can take anything from a few hours to a couple of days depending on how thick you make it. once dry you can sand and paint.